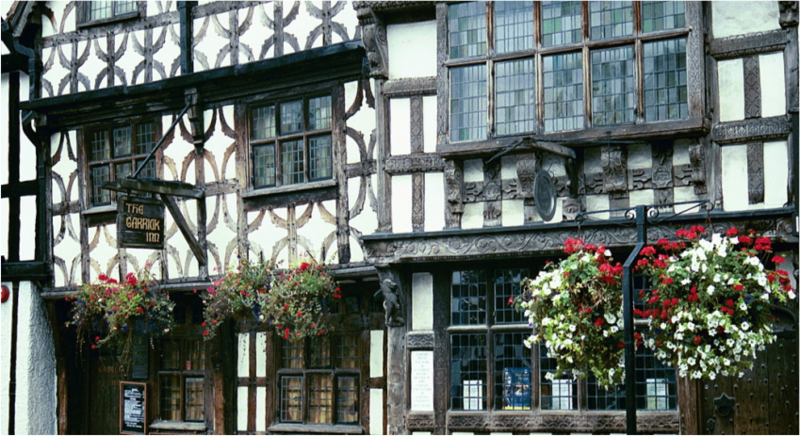 The number one tourist attraction in Stratford-upon-Avon is anything and everything to do with the Bard. We had to get up fairly early and stay after hours to snap these photos. That's the only reason they're not swamped with tourists! 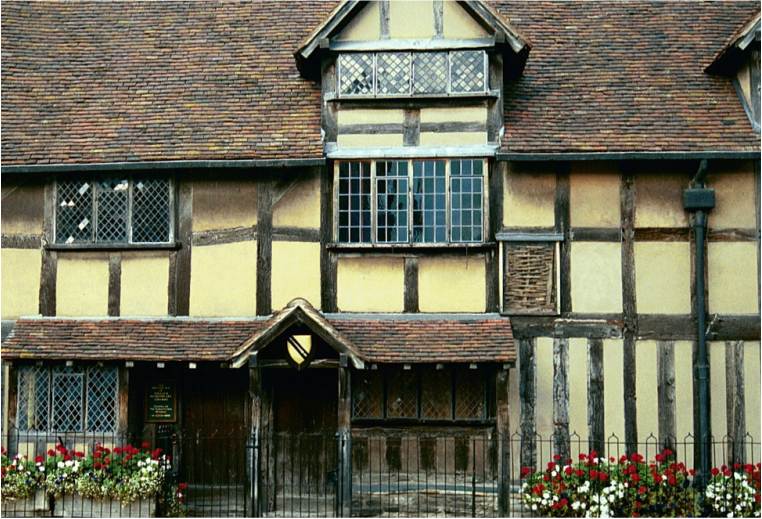 This is the house where William Shakespeare was born in 1564. This we know. But although history records tell us some of the details of his life, there are many mysteries. We know he married Anne Hathaway on November 28, 1582. (See her pretty little cottage here) William was 18 at the time, and Anne, who was pregnant, was 26. We know their first daughter, Susanna, was born on May 26, 1583. We know they later had twins, Hamnet and Judith, in 1585. But then Shakespeare disappears sometime after the birth of his twins. Seven years later, in 1592, he turns up London. Look at that glass in the windows! 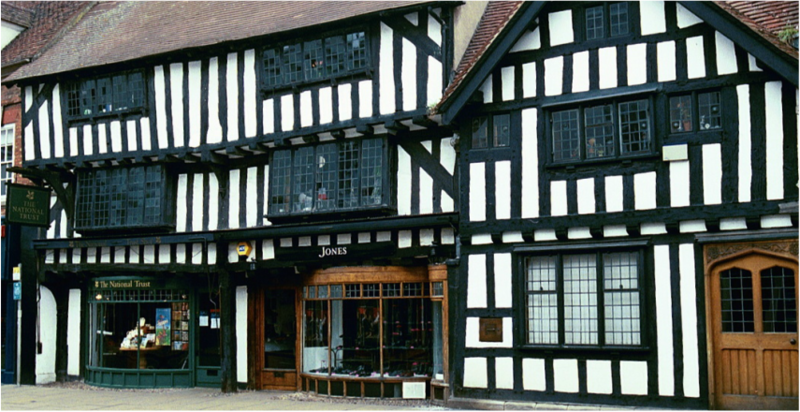 Shakespeare's house is a half-timbered structure, which was common practice for builders in Medieval times. "Half-timbering" refers to the fact that the huge logs were halved. It's nice when words mean exactly what they say. In half-timbered buildings, the wood framing is left exposed, and the spaces between the timbers are filled in, either with plaster, brick, or stone. One thing you could count on in a half-timbered house is that the inside would not be anywhere near warm and toasty. Now you know. The River Avon is the river on which Stratford is "upon." Note that the word "river" comes first. Here's a little tidbit of useless knowledge to casually drop at the office Christmas party when conversation lags: the word "Avon" is derived from a Celtic word meaning “river." That should get the conversation started right back up. When you drag kids to places afar, you'll want to make time for the simple pleasures. Like feeding the waterfowl on the river upon which Stratford is situated. Slowing down and getting in touch with mother nature and the cute local pets can be a relaxing way to end a strenuous day of sightseeing. After all, visiting castle dungeons and playing with ancient weapons can be unsettling to a young child's mind before bed. Unless the little beasts won't let you go. In which case you just have to run and call for your dad. And wish you had some of that weaponry from the castle. This is the famous row of Almshouses. There were built at the beginning of the 15th century as houses for the local elderly. We ate here but all I can remember is blood pudding, which I have completely blocked out of my mind forever. I am fascinated by the design work on these buildings. Also, the glass panes. I love seeing modern shops on the ground floors of historic buildings.